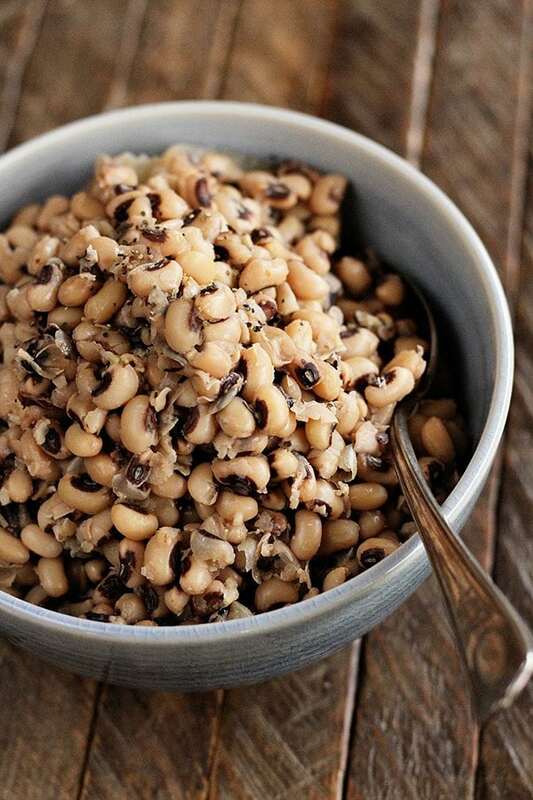 Black-Eyed Peas on New Year’s Day: Down here, we’ve got some superstitious folks. And with the arrival of the new year, many of those superstitions are put on full display. In our family, the food on the table on New Year’s Day has always been a big deal. We have to have some type of green, pork, and black-eyed peas. Greens are supposed to represent folded money and ensure that you’ll have money in the new year. We usually have collard greens on the menu to satisfy that requirement. Pork is almost always in the greens and peas in the way of smoked ham hocks, but we usually have a traditional ham as well – just for good measure. 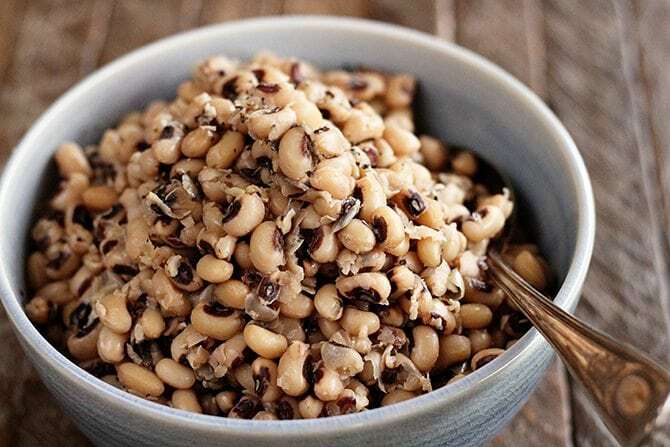 Now, black-eyed peas are said to represent good luck. Some folks even go as far as eating 365 peas to ensure good luck for every day of the new year. My family also puts a few dried black-eyed peas in our wallets – again, just for good measure. There are tons of other traditions and superstitions, too. My grandmother refuses to wash clothes on New Year’s Day. She says that doing so will mean you’ll be washing someone out of your life in the new year. She claims that she’s only done it one time in her life. My uncle was little and she had to wash diapers. That same year, her father died. Now, I’m not saying any of these superstitions are true. I’m just saying that I’m not going to take any chances. And since I’m a huge fan of ham, greens, and black-eyed peas, it’ll work out just fine for me. Slow Cooked Perfection: Now… Some things, especially dried beans, are just best when slow cooked. And when you don’t have time to tend a big old pot of beans all day, your trusty slow cooker is the perfect stand-in. 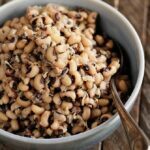 Since black-eyed peas are small, they don’t really require presoaking. You’re welcome to do that and it will cut down on the cooking time. However, I’ve tried them both ways and I actually prefer them not soaked. The texture is creamier to me and the flavor is more bold. Either way, these are delicious. And it doesn’t hurt that eating them might bring you good luck in the new year. I’m just saying. Y’all enjoy! Sort and rinse the peas, discarding any discolored peas. Add the peas, water, bullion cubes, salt, onion, garlic, and ham hock to the crock of a 4 to 6-quart slow cooker. Cook on low for 8 to 10 hours or on high for 5 to 6. You’re supposed to have a dollar bill in your pocket all day New Year’s Day so you will be prosperous in the New Year. My mother would always wash a silver dime and put in the black eyed peas for good luck to the person who got the dime. I think it was to get us to eat the peas. We would also have cooked down cabbage, fried sweet potatoes, pork chops and corn bread. Could you use chicken broth for the bouillon cubes? Absolutely! I just find that many folk opt for the bouillon because it’s cheaper than buying a couple of cartons of broth. Do you have to soak the beans first, or just put them in the pot as-is after checking for rocks and stuff?? John, Stacy said she’s done it both ways and prefers not soaking. I still soak mine but if I’m using my slow cooker I usually only soak about 4 hours. I think it’s just a habit for me. I’ve never fixed them without soaking so can’t comment on how they do but she said they have even more flavor. Hoping you see this in time. Happy New Years!! Thanks for getting back with him, Patty! Happy New Year!! If you soak them you don’t toot as much, lol! I cook the ham hocks with water and spices first. Wash the peas and pour the cooled liquid of ham hocks over them and refrigerate over night because I think increases flavor. I do pick meet off the hocks I cook in slow cooker with your ingredients until done I add flaked red pepper Love the tradition comments! Is there a vegetarian way to do this you would recommend? Can you just drop the ham or should you substitute something for it? You can buy a couple of cartons of vegetable broth…and perhaps step it up with additional seasonings per taste and preference. I can help with making them vegetarian! I was vegetarian over half my life. Smoked paprika is great, but you can get a vegetarian version of chorizo now that I think tastes better than actual pork chorizo. I don’t usually try to substitute though. I’ve never liked liquid smoke. It always tastes fake to me, but many people love it. I have used smoked salt, but it’s hard to find. 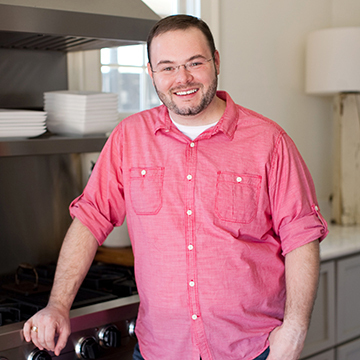 My hubby usually smokes a quart or two of kosher himself (we’re both chefs….which means we’re giant food geeks lol). For a veggie version, I’d brown a large onion in some olive oil, then add garlic – lots of garlic! Stir it around a bit. Slice up about half a pound of cremini mushrooms and brown those too. Put all of this in the crock pot. Put your beans in, along with veggie broth and a can of diced tomatoes. I’m in the midwest. You cannot get a decent fresh tomato here until about June. They look pretty, but taste like nothing. If you have tasty fresh ones, chop up a couple of those instead. Add your spices – personally, I put in about 2 teaspoons ground cumin, 1 Tablespoon smoked paprika, 1 teaspoon dried mexican oregano, at least 1 teaspoon of chili powder – I use dried ancho for this, a couple bay leaves, and a couple Tablespoons of soy sauce or Tamari. Cook it the way Stacey instructed. Add salt and pepper to taste after. If you spice it enough, you’ll need very little salt to be satisfied. 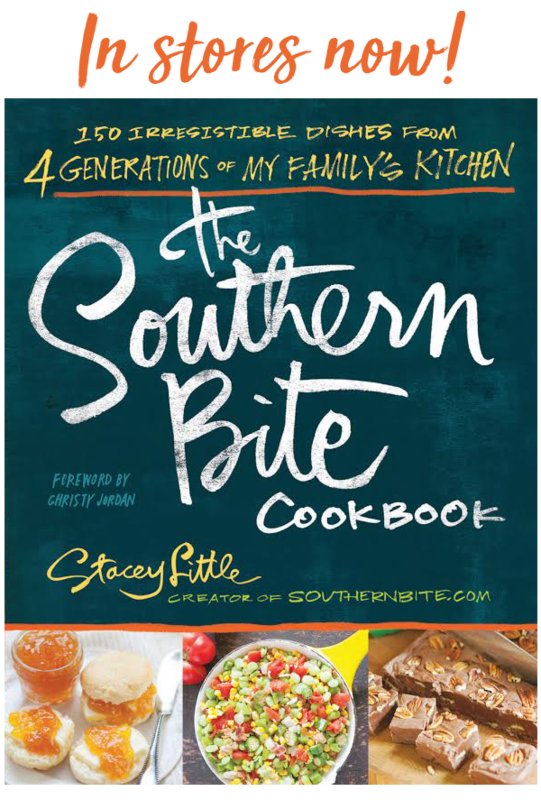 I’m a chef, but I’m not a snob, and I am Southern! I love me some greens! I like collards, but I like to saute a sliced up red onion first, then rinse and julienne (cut into thin strips) my collards and saute them lightly with the onion. I like them where they are just starting to wilt, but still have some chew to them. After that, just a generous sprinkle of black pepper, and a drizzle of balsamic vinegar on top – yum! My momma called a heathen for serving them to her like this though….. She liked them boiled down with some mustard on top. All that being said, I am no longer a vegetarian. We cured and smoked a small ham for Christmas. I just pulled the ham bone out of the freezer. Can’t wait! I came to this sight because even though I’ve been a chef a long time (27 years), I’m still learning every day. I’m rather inexperienced in the realm of slow cookers, but I have to work tomorrow. I want my beans ready when I get home, so Stacey – Thank You for educating me on the slow cooker. HAPPY NEW YEAR! Thank YOU, Cindy!!! Happy New Year! You can certainly just leave out the pro but will miss out on the smoky flavor? Do they make a vegetarian friendly smoke seasoning? Never heard of one. That would be rather unique. What about adding some smoked paprika? Or liquid smoke, which I think is vegetarian. 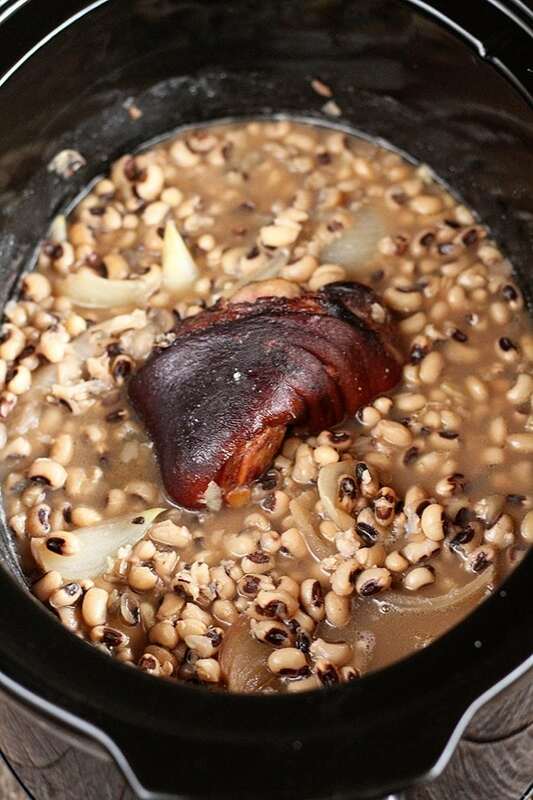 We put the carcass (breast bone from the Christmas turkey) into the black-eyed peas. Simmer it all day with a little onion and garlic after pressure cooking it 3 minutes. We soak the peas overnight too, but probably not required. We remove the Turkey bones before serving. Incidentally, we freeze the carcass after Christmas dinner and save it for New Year’s. I have got a mess of pork neck bones (with a nice dark smoke on ’em) that are just begging to jump in the slow cooker this year! I think I’ll let ’em. Happy New Year!!! I also like to add an envelope of Sazon Goya seasoning, “con cilantro y achiote”. Adds a nice flavor. Just a little something I learned from a Spanish neighbor. It’s really good if you are a vegetarian, and don’t use pork. I’m glad I found this post. Everyone here has great ideas on how to cook the Good Luck Beans. I’m certainly going to take a bit from everyone who posted. So, here at 8:30pm 12-31-2018 I’ve already prepped my goodies. I started off by boiling a smoked ham hock and a 1/4 teaspoon of crushed red pepper, just to get the broth from it. I thought I’d soak the peas in in overnight but now after reading this post, I’m not pre-soaking the peas at all since I have this new found broth to cook in tomorrow. I plan on starting in the wee hours with the second ham hock and the “homemade broth”. Bring it all up to a boil in the crock pot on high and then switching to low and adding Campbell’s french onion soup and a bit of water (all to cool it down) and then add the pre-washed black eyed peas. Hours later I’ll start adding to my pot (not necessarily in this order) carrots, celery, Kielbasa sausage, seared bell peppers, onion, bacon bits, potatoes. I’ll add the carrots and potatoes first just to make sure they are fully cooked. Hard potatoes and carrots will never be acceptable when they are undercooked. Later I’ll add the onions and about an hour later add the celery as undercooked onions and celery are better crunchy than sappy overcooked and mushy. Finally I’ll add the bacon bits (Hormel) about two hours from the finale. Since the sausage is already cooked as well as the seared peppers I did earlier tonight, I’ll add them in the last hour or so as they just need heating up. I don’t want to add the sausage earlier just in order to get flavor from it as the ham hock will add plenty of flavor and the sausage has its own distinctive taste. Sure! It’s best if it’s smoked. Yes, I used smoked neck bones because the store didn’t have hocks, pig tails are also the bomb in them! Can’t wait to eat!!! Could you substitute beef bouillon for the chicken bouillon? Coornbread for gold. Greens for folding money. Black-Eyed Peas for luck 365 for each person. Collards are my favorite greens. My mother from Alabama taught me this. (We do the turkey carcass, too but just for soup between Christmas and New Years Day) She speculated that this traditional meal emerged from the ‘hard times’ after the war between the states when fancy food was is short supply. Make perfect sense. Thanks for sharing, Will!